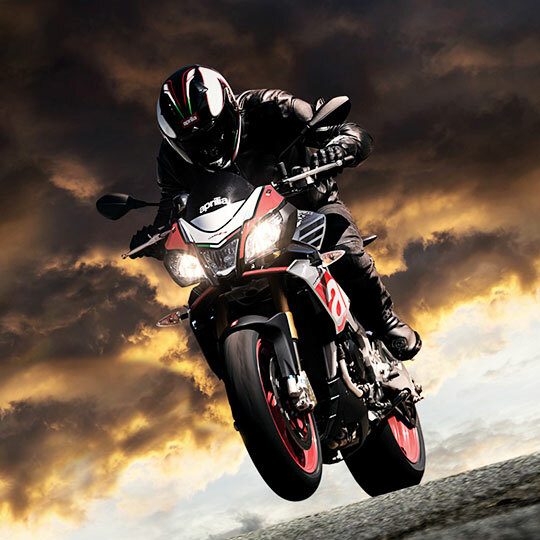 Aprilia was created with motor-racing and is the Piaggio Group��s front-runner in sports competitions..
Aprilia became part of the Piaggio Group in 2004. With the re-organisation of the Noale Racing Division, the Group has broadened the horizons of its racing activities, from the return to off-road competitions to the World Superbike debut �� in 2009 �� of the Aprilia RSV4. This highly successful project has secured seven world titles from 2010 to 2014. Today the extensive Aprilia motorcycle offer presents a varied range of models, whose common features are state-of-the-art technology and a sporty personality: from the twin-cylinder naked Shiver 750 to the Dorsoduro supermotard (in two displacements, 750 and 1200), from the Mana 850, the world��s first automatic motorbike, to the very latest entry, the Caponord 1200, a formidable tourer, from the supernaked Tuono V4 to the RSV4 family, available in two versions, the R and the Factory, based directly on the reigning world SBK champion bike. The Aprilia scooter range is equally impressive: the flagship Aprilia SRV850 is the most powerful scooter ever produced and features an advanced electronic control package with traction control and ABS. With a wealth of technical solutions leveraging its unique racing experience, today the Aprilia motorcycle range has established an absolute technological leadership. The bikes�� impeccable chassis �� always a key Aprilia strength �� are combined with cutting-edge engine technology (the RSV4 is the only mass-produced racing V4 engine in the world) and an undisputed primacy in electronic rider support systems. With each Aprilia motorcycle, the experience built up at racing events all over the world is transferred to the everyday user, to boost performance and safety.